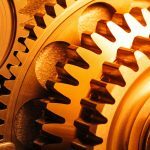 Recent developments allow the integration of heat treatment into the gear manufacturing line and to synchronize heat treatment with gear machining. 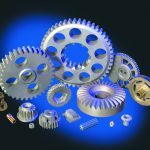 For decades the gear industry has faced the challenge of producing high performance components in a cost-effective manner. To meet quality specifications the components need to be heat-treated, which traditionally takes place in a central hardening shop. However, this separation between machining and heat treatment leads to high costs resulting from transportation and logistics within the production plant. 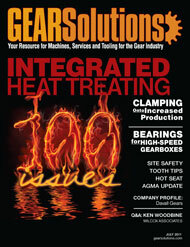 For this reason integrating heat treatment into the manufacturing line has been pursued for many years. For the past decade or so it has been possible to integrate heat treatment into the machining facility by applying Low Pressure Carburizing (LPC) and High Pressure Gas Quenching (HPGQ) technologies. The components are collected into big batches after soft machining and treated using the LPC and HPGQ processes. This means that the heat treatment is not synchronized with soft and hard machining, however, since the components must be collected in buffers before heat treatment and then separated once again afterward. In order to totally integrate heat treatment into the manufacturing line, and to synchronize heat treatment with machining, ALD Vacuum Technologies has developed a new heat treatment module. Following the philosophy of “One-Piece Flow,” the parts are taken one by one from the soft machining unit, heat treated in time with the cycle time of soft machining (Synchronized Heat Treatment), and then passed down one by one to the hard machining unit. • Compact and space-saving heat treat module. This paper introduces the new process technology and the new heat treatment module. As mentioned previously, integrating heat treatment into the manufacturing line has been a topic of discussion for many years. 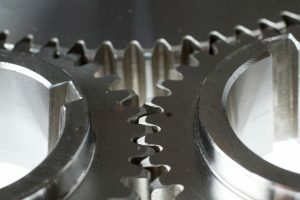 Today’s production philosophy for gear components usually relies on the traditional separation between soft machining, heat treatment, and hard machining. Heat treatment is performed in a central hardening shop, and there is no continuous flow of production parts between the different operations such as soft machining, heat treatment, shot peening, and hard machining. Instead the parts are first collected into batches and then moved from operation to operation, so large numbers of production parts are being stored in buffers or are in transit between the different operations. 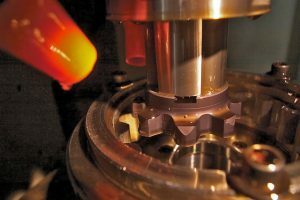 A continuous flow of production parts between operations is only occurring today between some of the soft machining operations and some hard machining operations. This discontinuous flow of production results in increased logistical and documentation efforts, increased turnaround times and, ultimately, in increased production costs. 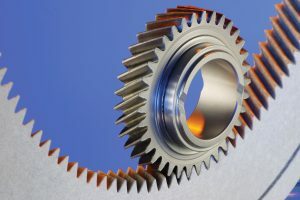 In order to establish a more effective and economic production of gear components, the goal is to move away from batch-type logistics and toward a “One-Piece Flow” (OPF) of production (see Figure 1). The goal is to move single parts from operation to operation instead of moving batches of parts. This OPF production system would realize a continuous flow of production parts and avoid huge efforts made in the storage and transportation of parts between operations [1,2]. 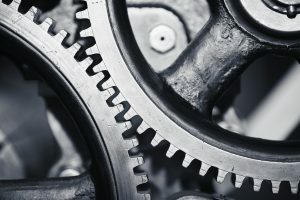 If such a total integration of all operations can be established it will offer new possibilities for automation, which again leads to a reduction of costs. Additionally, a higher level of automation will result in a reduction of quality defects. • An eco-friendly technology that can be integrated into a modern production environment. For a rapid case hardening process that matches the cycle times of soft machining, it is necessary to accelerate the carburizing cycle drastically. Developments toward accelerating the case hardening process began years ago. 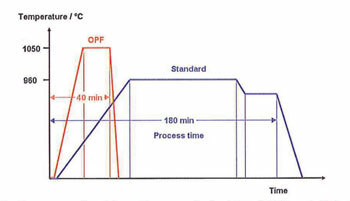 The established process of LPC [3,4,5] was successfully elevated to higher temperatures to reduce process times [3,6]. However, this increase in process temperature called for the development of new micro-alloyed materials to avoid unwanted grain growth. Three fields were therefore identified that required development: materials, processes, and equipment. Conventional case hardening steels such as 16MnCr5, 20MnCr5, 18CrNiMo7-6, etc., can develop unwanted grain growth when treated at temperatures above 960°C. Several years ago steel suppliers started developing new micro-alloyed steel grades to prevent unwanted grain growth . These micro-alloying elements form precipitates during the steel production process that act as grain boundary pinning particles, and thus detain abnormal grain growth during heat treatment at high temperatures. For high temperature carburizing up to 1050°C, such steels have a controlled amount of nitrogen N (120-170 ppm) and aluminum Al (250-350 ppm). Further, a small amount of niobium Nb (320–400 ppm) is being added to the steel. The steel production process route is controlled in a way that an optimum size and distribution of the Al(N)- and Nb(C,N)-precipitates are being secured. Several micro-alloyed steel grades have been developed and successfully tested jointly by steel suppliers and gear manufacturers [8,9]. 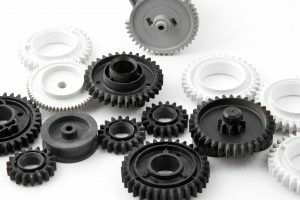 Several gear manufacturers are currently in the process of adjusting their material specifications to allow for high temperature heat treatment. 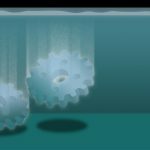 Any negative influence of micro-alloying on the gear machining process has not been reported. Furthermore, the material needs to have a sufficient and controlled hardenability to allow for quenching with moderate quench intensities. High quench intensities should be avoided to facilitate a cost-effective gas quench process. Typical steel grades suited for that process are 20MnCr5-HH, 23MnCrMo5, 27MnCr5, 18CrNiMo7-6, or 20NiMoCr6-5. Low Pressure Carburizing (LPC) is a case hardening process that is performed in a pressure of only a few millibar in a protective atmosphere. In most applications acetylene is used as the carbon source. LPC is a clean and eco-friendly process that provides case hardened parts without any surface-oxidation [3,4,5]. LPC is usually combined with High Pressure Gas Quenching (HPGQ). During HPGQ the load is quenched using an inert gas stream instead of a liquid quenching media. Nitrogen or helium are usually used as quench gas. HPGQ provides clean components and offers significant potentials for lower distortion values compared to oil quenching . The case hardening process basically consists of three steps: austenitizing, carburizing, and quenching. 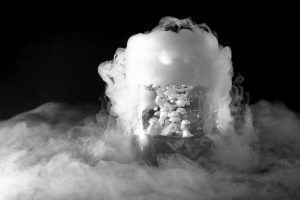 Carburizing is a diffusion-controlled process. The diffusion coefficient of carbon in steel is strongly dependent on temperature. This means that the carburizing step during LPC can be accelerated strongly if the carburizing takes place at elevated temperatures. For example, when carburizing at 1030°C instead of 930°C the total treatment time of parts made of 18CrNiMo7-6 is reduced by 40 percent for a given case hardening depth CHD = 1,5 mm . This high temperature low pressure carburizing HT-LPC has recently been developed and tested successfully [3,6]. 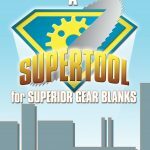 Combined with gas quenching, it offers a rapid case hardening process with low values of heat treat distortions. Figure 2 shows the comparison between a conventional LPC process and the HT-LPC process. For a given CHD of 0,65 mm, the cycle time is reduced from 180 min to 40 min. As described above, the carburizing cycle can be accelerated drastically by the application of HT-LPC. 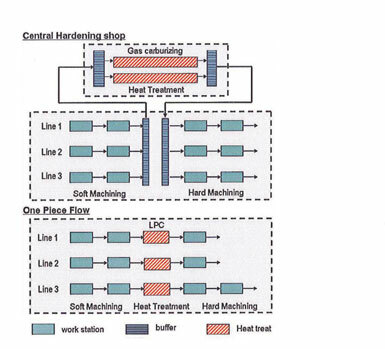 However, this accelerated process still does not allow the carburizing of one part after another while matching the cycle time of soft machining, so it was decided to perform the case hardening in single layers of parts called “2D batches” (Figure 3). These 2D batches can be heated up to carburizing temperature much more quickly than large 3D batches consisting of several layers due to effective heat transfer by direct radiation in vacuum. Additionally, the single layer concept offers a very homogenous treatment in all process steps such as austenitizing, carburizing, and quenching. Figure 4 shows the new SyncroTherm® heat treatment module, developed and filed for patent by ALD Vacuum Technologies. This heat treatment module allows total integration into the manufacturing line, and therefore a synchronized production with gear machining. Following the philosophy of “One-Piece Flow,“ the parts are taken one by one from the soft machining unit, heat treated in time with the cycle time of soft machining (Synchronized Heat Treatment), and then passed down individually to the hard machining unit. 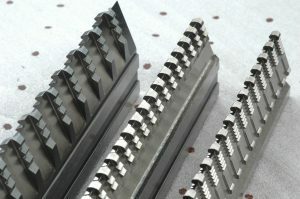 Although the parts are not treated singly but in trays, they are individually loaded to the heat treat unit and unloaded from it in the same way, so the continuous flow of single parts is established. A 2D batch with untreated “green” parts enters the system through the door of the quench cell. After evacuating, the tray is then brought with an elevator through the housing into one of the “hot zones.” A hot zone is a single slot that can hold one tray of parts. There are six hot zones arranged vertically inside the housing. The pressure in all hot zones is identical, but each hot zone has its own temperature control and supply of process gases. Once the tray has entered a hot zone it is being heated up rapidly from all sides and then carburized at 1050°C using acetylene. After the carburizing is completed, the tray is brought with the elevator back to the quench cell. After closing the door between quench cell and housing the quench cell is flooded with nitrogen, which circulates through the cell. A heat exchanger inside the quench cell is used to recool the circulating gas. The system works with a maximum gas pressure of 10 bar nitrogen. But to keep running costs low it is recommended to quench with max. 6 bar nitrogen. Once the quenching is completed the quench cell is vented to atmospheric pressure, and the parts are then removed from the SyncroTherm unit and enter the tempering unit. After tempering the parts are singularized again and passed down individually to the hard machining unit. The SyncroTherm system has integrated quality control; If the process parameters are out of specification for a tray of parts, then the tray is automatically discharged from the manufacturing line and quarantined. The cycle times as given in Figure 2. were tested and verified successfully. Figure 5 shows the heating curves of different gear components measured with a mobile temperature-logging device. 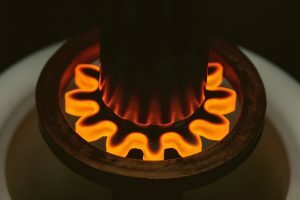 All three different gear wheels were heated within 16 min up to the carburizing temperature of 1050°C. This quick heating, in combination with the HT-LPC process, results in very short process cycles. 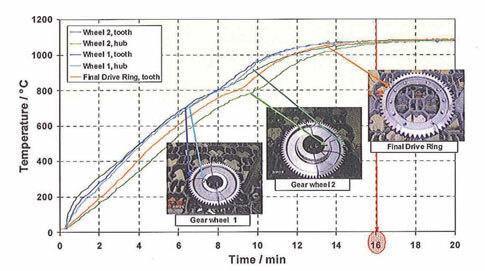 Figure 6 shows the quality achieved during a 38 min cycle on gear wheels made of 18CrNiMo7 6 material. The targeted CHD of 0,6 mm and all other specified values were met successfully. Depending on the needed capacity, a SyncroTherm unit can be equipped with different numbers of hot zones. Table 1 shows an example of how to calculate the necessary number of hot zones. 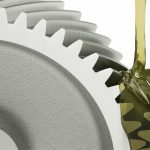 In this example one gear wheel leaves the soft machining operation every 20 seconds. 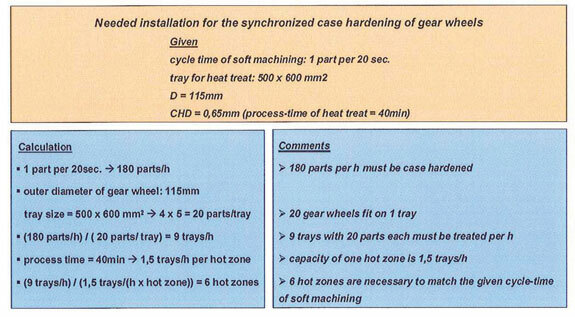 The calculation shows that it is necessary to install 1 SyncroTherm unit with six hot zones to achieve the targeted CHD of 0,65 mm and to match the given cycle time from soft machining. The integration of a SyncroTherm module into a fully automated manufacturing line is shown in Figure 7. 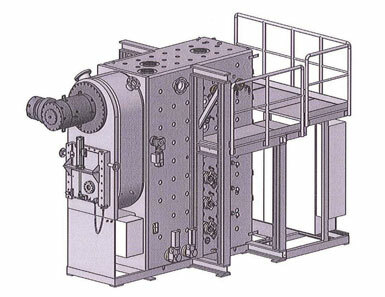 This FELSOMAT FlexLine® consists of several modular production segments. The “green” blanks enter the system from the left. 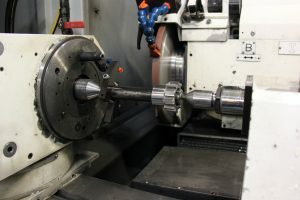 The first operation is the green machining unit—turning, hobbing, chamfering, and deburring—followed by the ALD SyncroTherm unit and then the hard machining unit (hard turning/grinding, gear hard finishing, and washing). Finished gear components leave the system on the right and are ready for assembly. • Compact installation; required space is only 50 percent of the space required for conventional production. 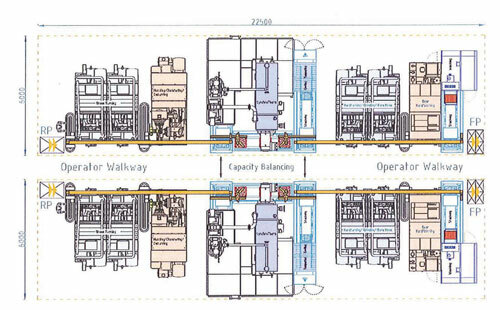 The potential layout of two integrated manufacturing lines can be found in Figure 8. 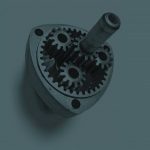 Conventional gear manufacturing concepts rely on the separation of different operations such as soft machining, heat treatment, and hard machining. This implies high logistical efforts, efforts for documentation, and high turnaround times, which ultimately leads to avoidable production costs. 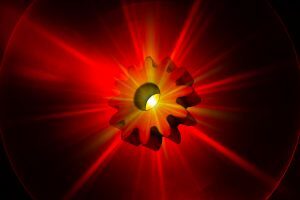 With recent developments regarding materials, process, and equipment it is now possible to integrate heat treatment into the gear manufacturing line and to synchronize heat treatment with gear machining. Micro-alloyed steels have been developed that prevent grain growth even at high carburizing temperatures of up to 1050°C. The process of High Temperature Low Pressure Carburizing (HT-LPC) was successfully developed, which now allows for rapid case hardening. Consequently, a new heat treat module was designed and built that can be integrated into the manufacturing line. This new module, called SyncroTherm, offers a rapid heat treatment process that is fast enough to match the cycle times of soft and hard machining. In this system the parts are being treated in single layers instead of large batches consisting of several layers. 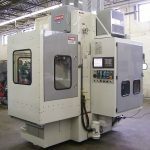 Following the philosophy of “One-Piece Flow,” the parts are taken individually from the soft machining unit and passed down one by one to the hard machining unit. Since the parts are treated in single layers instead of large batches, this new heat treat system provides a very homogenous treatment in all process steps such as austenitizing, carburizing, and quenching. This homogenous treatment offers potentials to reduce heat treat distortions significantly. A prototype SyncroTherm unit has been installed in ALD’s lab in Hanau. 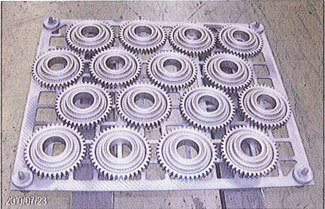 Gears with different geometries made of various micro-alloyed steels will be tested in future trials. The turnaround times and the metallurgical quality will be checked. Furthermore, special test series will be initiated in order to optimize heat treat distortions. 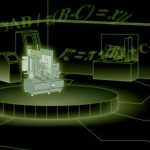 If distortion is reduced significantly, then subsequent hard machining operations can be reduced, or maybe even completely eliminated. 7) Hippenstiel, F.: Innovative Einsatzstähle als maßgeschneiderte Werkstofflösung zur Hochtemperaturaufkohlung von Getriebekomponenten, HTM 57 (2002) 4, pp. 290-298. 8) Hoch, S.; Kleff, J.; Kellermann, I.; Schulz, M.: Temperature – the key to optimize cost and result in carburizing vehicle driveline parts: Proceedings of the Intern. Conf. on Steels in Cars and Trucks, June 5 to 10, 2005, Wiesbaden pp. 245-255 (ISBN 3-514-00718-7). is with ALD-Vacuum Technologies GmbH, which is located in Hanau, Germany. Go online to [www.ald-vt.de]. is with ALD Vacuum Technologies GmbH in Hanau, Germany. Go online to [www.ald-vt.de].